As the founder and Managing Director of Yourself Management, a marketing agency based in Roodepoort, Johannesburg, Kabelo Ncholo (32) expresses the essence of Global Entrepreneurship Week (GEW). Yourself Management provides marketing services for numerous clients and is currently putting much of its energies into promoting OpenView HD, South Africa’s first free HD satellite TV service, with over 18 exciting channels. GEW, which runs from 16 to 22 November, is the world’s largest celebration of innovators and job creators who launch startups that bring ideas to life, drive economic growth and expand human welfare. GEW inspires people everywhere through local, national and global activities designed to help them explore their potential as self-starters and innovators. A platform for connection and collaboration, millions who had never considered launching their own businesses soak up advice and inspiration. South Africa is one of over 140 countries participating in GEW. To mark this special week, there will be a range of intriguing workshops and seminars on entrepreneurship in cities countrywide. Kabelo loves being an entrepreneur because he’s in control and is building a legacy while creating employment at the same time. Coming from very humble beginnings, he has launched and run a successful business over the last 11 years. With an annual turnover of R20 million, the company currently operates with 15 full-time staff and has hired 2000 people since launching in 2004. Yourself Management also supports other small businesses by outsourcing work to them. In his role as Managing Director of Yourself Management, Kabelo is responsible for implementing the agency’s policy, maintaining an e­ffective management team and developing strategic plans. His position extends to putting operational planning and financial control systems in place and ensuring that the operating objectives and standards of performance are understood and owned by all employees. Over Yourself Management’s existence, the company has provided marketing services for various clients including Absa, Cell C, Microsoft, Nestle, Tiger Brands and L’Oreal SA among numerous others. Yourself Management has carried out marketing for these companies through a variety of interventions including in-store promotions and activations at beaches, schools and tertiary institutions. A burning desire to succeed and to rise above his circumstances has powered Kabelo with the determination to realise his ambitions and achieve business success. Born and raised in Geluckspan, in the North West Province, he wanted to study medicine after matriculating in 2000. This dream was fuelled by his underprivileged background and shame around the state of his family. Kabelo is one of five children brought up by a single mom who worked as a helper. He arrived in Joburg in February 2001 hoping to register at Wits. However, when he got to the city registrations were closed, so he began upgrading his marks to get a space the following year. He was soon hired as a waiter at MacRib Family Restaurant in Milpark. “I started a business called Yourself Function Organizers and began doing school-leaving events after identifying an opportunity when schools used the restaurant for matric farewells,” explains Kabelo. He later changed the name of the company to Yourself Events – Management and registered it. From 2004 until 2007, the agency focused on events coordination, hosting parties at clubs and coordinating events for diff­erent tertiary institutions. 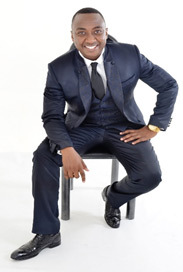 In 2008, after being asked to do promotions in Soweto, he positioned the business as a promotions agency. This decision was influenced by profit and was less stressful than coordinating events. From then on, the company worked with different agencies to understand the business and build confidence before going for direct clients. On meeting Michelle Combrinck, the owner of Zinto Marketing in 2008, Kabelo asked her to be his mentor. “Through her mentorship, I started to develop a clear vision for the company and used Zinto Marketing as a benchmark,” he explains. In 2009, Andre De Lecerda, the Managing Director of Samplex became his mentor. That same year, the agency traded as Yourself Management to cater for below the line marketing services. He soon landed his first direct client – Tiger Brands – which he’s still servicing to date along with numerous other clients. Over 1000 Further Education and Training (FET) College students studying marketing-related subjects do weekend promotions at stores to gain first-hand experience. He has also hired 50 FET College students to work on the company’s new field marketing service. Kabelo shows the true power of entrepreneurship in delivering quality services that achieve impact and reach, while also creating job opportunities that reduce our extremely high rates of unemployment. 1.How have you managed to achieve success at running Yourself Management? Being patient and consistent have played a huge part in the agency’s success. The first six years were especially challenging, but I kept going because I believed things would work out. 2.What is your message to young people wanting to start their own businesses? Entrepreneurship is like a career; you have to be prepared to go through challenging stages. This is just the same as building a career where you have to do tests and exams to officially qualify to follow it. If you are willing to work hard, you must definitely go for entrepreneurship. However, you mustn’t expect to make money quickly. If you want that, then it’s best to look for a job. 3.What are your plans for the business? I am already expanding the agency with the birth of Yourself TV which will focus on advertising and television programmes that are still being produced. We are busy setting up a music label department called Yourself Music that operates as an independent recording stable. By 2017, we hope to make an annual turnover of R50 million.